Welcome to the New Release post and Blog Hop showcasing projects from Our Daily Bread Designs November Release! You can see all of the November Releases here. Continue reading below to find out how you can win one of three $25 Gift Codes to the ODBD Website! Today I'm sharing two cards using the new Merry & Bright stamp set, Snow Crystals, Snowflake Sky and Christmas Lights die sets along with the Snowflake Season paper collection from the November Release along with some additional ODBD Stamps, Die Sets and Paper Collections (see supply list below). My first card is a Fancy Fold using the Double Display Card Kit. These card kits take the guess work out of cutting and scoring, as the bases are cut and scored, there are 6 in a package, 3 White and 3 Ivory. The sentiment and lights are from the Merry & Bright stamp set. The lights from this set are die cut using the Christmas Lights die set. Because clear stamps tend to get wonky when adhering to the clear blocks, here's a tip to help you to ensure the die aligns with the stamp. Place the stamp face down into the die, then adhere the clear block to the stamps. Stamp and die cut according to the sandwich stamp for your particular die cutting machine. To embellish my card, I used the new Snowflake Season Paper Collection, cutting the panels to fit, adding the die cut lights, stamped sentiment panel and beautiful Snowfake Crystals cut from White, Silver and Ruby card stock. My next card features a window scene, using the tree from the Joys of the Season stamp set, and sentiment and lights from Merry & Bright stamp set, along with quite a few ODBD layering die sets (see supply list below). The card is embellished with the Snow Crystals die set. I did alter two of the dies from the Mini Tags die set, as I wanted to omit the loop on the dies. Here's the dies I used, and what the panels looked like after I altered my die cutting. Three randomly selected winners will each receive a $25 gift code to the ODBD Website just for commenting on the Design Team cards! You have until November 2, 2016 at 9:00 p.m. EDT to leave your comments. The Winners will be posted November 3rd, on Our Daily Bread Designs Blog, so be sure to check back there to see if you won! Lisa, your snowflake cards are beautiful! You've truly captured the essence of the season in them! Now if we could only get it to snow! Both cards are gorgeous, Lisa! You know how much I love the double display fold, and yours is beautiful! What a great idea to use the tree behind the window and so creative! Wonderful release projects, my friend! Beautiful double display fold card with those gorgeous papers! Love the stacked snowflakes and strings of lights on it too! Beautiful window card! Love it in the all gold tones/neutrals the way you did it!Beautiful!! Lisa, your cards are GORGEOUS and STUNNING with all the layering of die-cuts. Love your choice of colors and tones. Thank you for the inspirations! Awesome double display and I love the window scene! Fabulous job on both!! HUGS!! The display folded card is super festive, but the window scene is superb! Such creativity! Awesome cards! I love the fold on the first one and the second is stunning! Love the fold on the first one and the tree through the window on the second. Beautiful cards!! Love thefancy fold of the first card!! Beautiful paper!! Love the sentiment!! The second card is so lovely!! The window scene is awesome!! Hi Lisa...wow two beautiful cards...love the fold on your first card...and all the pretty snow flakes, and awesome verse...love how that gets showcased! !...and love your window card with the new lights and snowflakes...both are awesome!! I love both of your cards Lisa! The double display card is just wonderful! Love how you used the light strings and snowflakes to decorate the front panels! The silver and gold window card is beautiful too and great idea to put the tree in the window! Very clever!!! Beautiful release samples for sure!!! Gorgeous work, Lisa!! 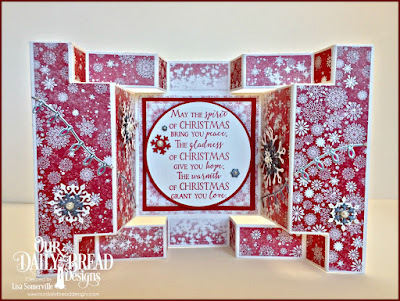 I just love your double display card with your added lights and snowflakes to frame that beautiful sentiment. Stunning design and very festive!! The second card is also stunning with the metallic window and the tree shining through. Very inspiring creations!! The window scene is a nice addition to the Christmas cards on the various ODBD designers blogs this month. I love the greens and the simplicity of it. The fancy fold card is stunning! I love the papers and how the beautiful sentiment fits perfectly! Your second card is quite handsome! Love how you altered those tags! That tip will come in handy! Awesome cards!! The fancy fold card is just amazing!! Love the folds on the first card. Lisa, beautiful samples! Love them both... the double display is fabulous! So creative on the window card and love the die alterations! Hi Lisa! Wow do I love your cards! The first one is so pink and gorgeous! And then the second with the tree in the window is amazing! Love how you altered the dies to make your tag! Smart!